The SugarCRM integration allows you to create customer contacts, leads or opportunities from ongoing or archived chats and save them in your SugarCRM. You can gather additional information about contacts in pre-chat surveys and store it in the CRM. Plus, it enables you to edit existing records and attach chats to them. SugarCRM is open source CRM software. It can drive sales force performance by allowing a sales representative to track and share contacts and opportunities. Users can upsell into existing accounts, forecast revenue, monitor performance through dashboards. SugarCRM also gives possibilities to easily manage quotes and contracts, work offline through our sugar mobile, and collaborate through integrations with other platforms. Thanks to the software, you can create, execute and track campaigns across multiple channels. You are able to develop compelling email marketing programs and capture contacts directly into your CRM system with contact forms. Plus, it will help you manage and assign contacts to your sales reps and track the marketing ROI. 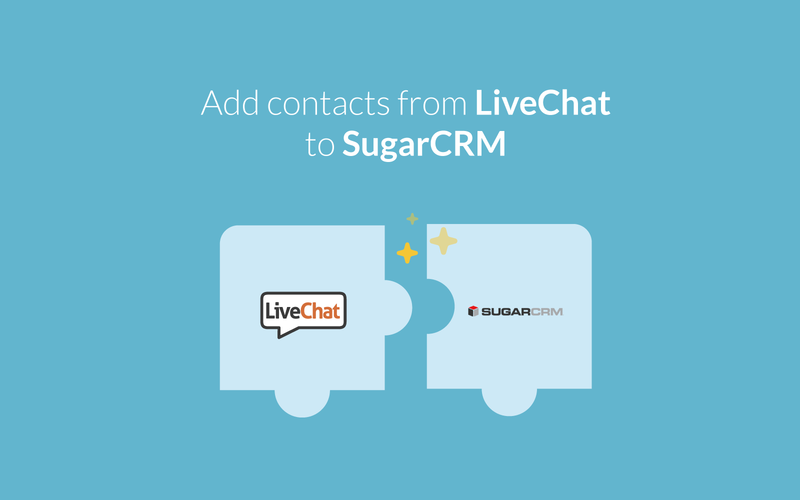 With LiveChat for SugarCRM, you can manage your Accounts and Leads without leaving your LiveChat application. Talking to a customer seems like a great opportunity? Now you can instantly save him in your SugarCRM and target his needs more efficiently. Update your existing customers with the chat record and shine bright when chatting with them later! Mentioning your previous conversations during a chat always does the trick and increases the customers' satisfaction in the process. The context gained from CRM records is key for sales and support team as they chat live with prospects. This integration provides that context right where they work - in the SugarCRM dashboard. Start using LiveChat with SugarCRM now!